New Recipe Alert. 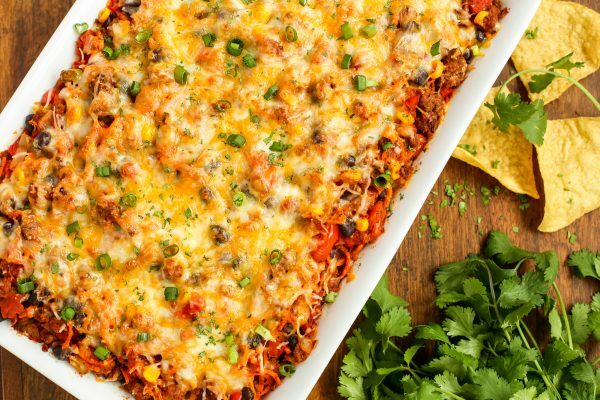 Check out this Recipe for a scrumptious Turkey Taco Casserole. Spray a 9 by 13-inch baking dish with cooking spray. In a large skillet, heat the oil over medium-high heat. Add the turkey and cook until browned, 5 to 7 minutes. Stir in the onion, mushrooms, and zucchini and cook until tender, about 5 minutes. Stir in the taco seasoning, 2/3 cup water, and the corn. Simmer until thickened, about 2 minutes, then stir in the kidney and black beans. Spread 1/2 cup of the salsa in the bottom of the baking dish. Lay the crushed chips over the salsa, and spoon half of the meat mixture on top. Cover with 3/4 cup of the salsa and 1 cup of the shredded cheese. Top with 4 more crushed chips and the remaining 3/4 cup salsa. Scatter the remaining 1/2 cup shredded cheese over the top. Bake the casserole until the cheese is melted and bubbling, about 25 minutes. Slice and serve, topped with scallions. Can also be made vegan by substituting vegetarian chorizo and vegan cheese.